Yield: About 4-5 cups when pureed. 2. 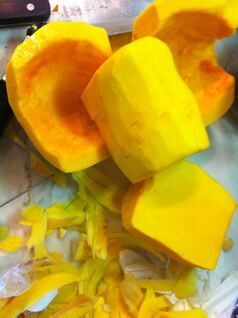 Cut one squash in half crosswise. Cut the half that contains the seeds in half and scopp out all the seeds and other junk that’s in there. Cut the other half of the squash into quarters lengthwise. Repeat with the other squash. 3. Place the squash pieces on a baking sheet lined with foil. Drizzle the pieces with 2-3 tablespoons of the olive oil, and use your hands to rub the oil over all sides of the squash. Sprinkle the squash lightly with salt and pepper. Roast it until it’s tender, about 35-40 minutes. 4. When the squash has cooled slightly, you can peel it, puree it in the food processor (adding a little chicken broth or cream to thin it if you want), eat it warm as a side dish (reheating it in a double boiler if you need to), and use the leftovers for soup. 1. Heat the butter and oil in a heavy-bottomed soup pot over medium low heat. When the butter is melted, add the leeks, curry powder, salt and pepper and cook until the leeks are tender, about ten minutes. Add the ginger and cook for another minute. 2. Add the broth and squash to the pot and stir to combine. Raise the heat slightly and bring the soup to a simmer. Cook for about 20 minutes, until the flavors are well combined. Stir in the coconut milk. 3. Puree the soup in batches in your food processor. Taste the soup and correct the seasoning if necessary. Reheat the soup and serve hot. P.S. Also see The Squash Diaries 1: Pumpkin. This entry was posted on Monday, November 29th, 2010 at 5:21 pm	and is filed under Beside Myself, Soup 'n Sandwich. You can follow any responses to this entry through the RSS 2.0 feed. You can leave a response, or trackback from your own site. DO NOT PEEL THE UNCOOKED SQUASH. I feel that you post needed those capital letters. Poke it and steam it. Slash it and bake it. But for Pete’s sake, don’t peel it when it’s still hard. Michael (my husband) has a *fantastic* recipe for butternut squash casserole that is more like a dessert than a side dish. No, really. It’s like *pudding*. Ooooo, I WANT that recipe!! I would have loved to watch you try hacking that thing. After all of that I would have carved it into animal shapes and played it off like I planned it that way…. You can see me hacking it up in my upcoming New Year’s Resolution video! I made butternut squash soup fr Thanksgiving also. I cut it up , drizzled with bacon grease and roasted it. Added a bit of chopotle , cream,broth and nutmeg. Blended it and it was very good. Cream of garlic is next. Cream of garlic? Whoa. I wanna hear about that one…! EVERY vegetable tastes better roasted. 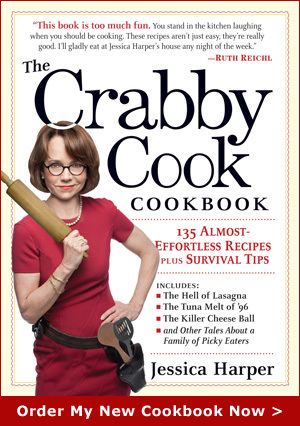 I am also a good, but lazy cook-so glad I stumbled onto your website. bronchitis, drizzly day in baltimore, pending divorce…. but your crabbiness really cheered me up !